It’s true. Throughout his painting life, Jim Isherwood found difficulty in selling his works of art. He had a handful of people willing to buy, but they did it out of kindness and compassion. Isherwood’s ability was to produce many different types of clowns. A number of clown paintings were found among the artist’s collection following his death and there was no evidence that he had ever sold one. He once told a journalist: “I’m fascinated by clowns. I’m a bit frightened of them too. Many people are. And yet in real life they are ordinary innocent people. When I paint clowns I am somehow trying to portray in oil just what’s inside their heads. But I think many clowns have a sadness about them. Sometimes their funny antics seem tinged with sorrow. Isherwood added: “People that come to my home to look at paintings shy away from the clowns. They say: ‘Oh no. my children couldn’t live with that. It would frighten them do death.’ In a way, I can see what they mean, but that said, I’m still drawn to creating clowns in paint. It must be something inside me. Genuine clown paintings don’t come onto the market very often, but when they do, they are snapped up. 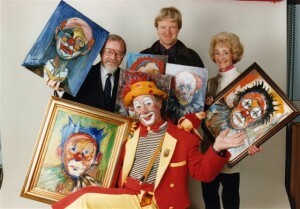 *Our photograph shows Molly and Clive Isherwood and (right) Geoffrey Shryhane with a clown and some of Jim’s clown paintings.